At Wellington Secondary College the staff care for their students, for every student’s personal welfare and for their academic progress. Students are expected to care for themselves , for their peers and for their community. This caring behaviour is reflected in the expectation and achievement of a safe and orderly environment marked by respectful relationships between staff and students and students with each other. All students and staff strive to achieve their best. All students have the right and the ability to learn so that they may develop into life long learners and valued members of a multicultural society. Staff are also expected to continue learning and to continue to develop their professional skills to a high level. self-image and to seek excellence in all areas of endeavour. Noble Park and Dandenong North communities and also to overseas communities. Student enrolment is approximately 1760 local students plus 100 International students. The campus is set amongst landscaped gardens and extensive courtyards. It includes a performing arts complex, well equipped specialist rooms, two multi-purpose gymnasiums and separate Junior, Middle and Senior School Centres. Currently the College is involved in Master Planning to provide modern 21st Century learning spaces for all students and staff. Nearby is Waverley Gardens Shopping Centre with a medical centre, department stores, post office, banks, chemist and supermarkets. The main Clayton campus of Monash University with other university campuses and TAFE colleges are within a fifteen kilometre radius of the College. Our school provides a safe and inclusive environment to meet the needs of all students. We are committed to the provisions of Ministerial Order 870 (Child Safety). The College prides itself on its committment to literacy and numeracy across the whole school. Public transport available for students is provided through several commuter bus routes and this is supplemented by a parent funded charter bus service. Approximately 400 students use this College charter bus service, choosing to travel to Wellington from surrounding suburbs. Waverley Gardens Shopping centre is also a major hub for public buses. 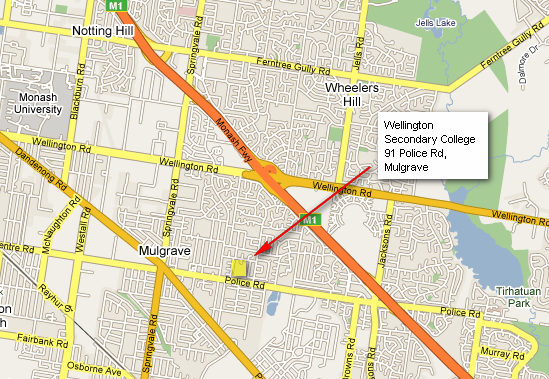 The closest train stations are situated in Springvale and Glen Waverley.